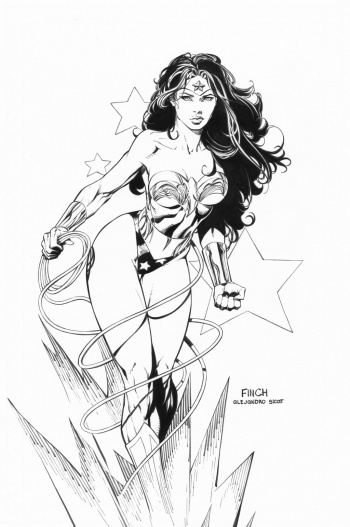 David Finch of The Dark Knight and Forever Evil is expected to lend his pencils to DC's most recognizable female superhero, Wonder Woman. Of all the changes made to DC Comics during the New 52, perhaps the most comprehensive was Wonder Woman's backstory. Her monthly series by Brian Azzarello and Cliff Chiang reimagined the character's entire mythology, making her Zeus' daughter as Olympian gods struggled for control in a modern world. As Azzarello and Chiang's storyline draws to a close however, the question now is who will step forward to move Diana in yet another new direction. According to Bleeding Cool, the next artist to take up Wonder Woman's pencils will be The Dark Knight's David Finch, and if this sketch is anything to go on, she'll be following a more traditional pre-New 52 art style. We're still waiting for confirmation from DC on what's planned for Wonder Woman, but it's likely her new portrayal will fall in line with the rest of the New 52. While readers have certainly enjoyed Azzarello and Chiang's run, its tone and storyline were largely independent of events across the broader universe, most noticeably in the Justice League and Superman/Wonder Woman books. A new creative team provides the chance to reconnect Wonder Woman to New 52 canon, although whether that will be as memorable as its first 30 issues remains to be seen.